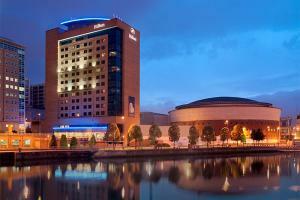 With an idyllic setting on the bank of the Lagan River, this Belfast hotel is just a short walk from the city center and about a mile from Titanic Belfast. Guest rooms are designed with comfort and convenience in mind, and serve as a welcoming retreat after a day out exploring the city. The hotel offers a fitness center as well as innovative dining options at Sonoma Restaurant. Located in Belfast, about a two minute walk from the city center and only a ten minute drive from Belfast City Airport.